All Hoagies are fresh, oven-baked & prepared to order on a 13" or 6 ½" buns. *Topped with lettuce, tomato & mayo, unless otherwise specified. Chicken* Marinated chicken breast, melted mozzarella & provolone. Italian Baked Baked ham, hard salami, melted mozzarella & provolone, green peppers, onions, lettuce, tomato & Italian dressing. Turkey, bacon & Cheddar* Delicious turkey breast loaded with bacon and cheddar cheese. Pizzaroni Fox's famous sauce, mozzarella & provolone, topped with lots of tasty pepperoni. Club* Baked ham, turkey, melted mozzarella, provolone & cheddar cheese. Veggie Mushrooms, green peppers & onions covered with melted mozzarella & provolone, topped with lettuce, tomatoes & Italian dressing. Chicken Ranchero Chicken breast strips, bacon, cheddar, provolone & mozzarella, lettuce, tomatoes and ranch dressing. Steak and Cheese* Choice sirloin steak, melted mozzarella &amp; provolone, sweet peppers, onions & mushrooms. Meatball This Hoagie is loaded with meatballs covered with Fox's famous sauce, topped with melted mozzarella & provolone. Turkey* Succulent turkey breast with melted mozzarella & provolone. Roast Beef* Tender roast beef piled high, covered with melted mozzarella & provolone. Ham & Cheese* Virginia-style baked ham, oven baked with onions & cheese. BLT Real bacon, baked with mozzarella & provolone. Chicken Parmesan Pizza sauce, breaded chicken parmesan & extra cheese. Tuna Homemade white tuna mix, onions, melted provolone & mozzarella. NEW! Gyro Hogie Specially seasoned meat, lettuce & tomatoes topped with tomato or cucumber sauce. Above is the standard way we prepare our Hoagies. If you want to make any changes, please just ask. We'll make your Hoagie just the way you like! BBQ A tasty, flavourful wing. Italian A wing with the taste of Italy. White Pizza No sauce, Olive oil, mozzarella & parmesan, beef, oregano, basil, onions, green peppers & tomatoes. Spinach Pizza Spinach, tomato, onion & fresh garlic. Veggie Pizza Sauce & cheese topped with green peeper, onion, mushroom & black olives. Steak Rancher Pizza Ranch dressing top with choice sirloin steak, mushrooms sweet pepper, onion, mozzarella & provolone. Bacon Double Cheeseburger Our sauce with cheddar, mozzarella & provolone cheese, topped with real bacon & beef topping. Spinach and Chicken Pizza Pizza sauce, spinach, grilled chicken, bacon, tomatoes, mozzarella & provolone. Pepperoni Extreme Extra, extra, extra pepperoni with loads of extra cheese. Deluxe Pizza Our sauce & cheese topped with pepperoni, sausage, mushroom, green pepper & onion. Meat Lovers Our sauce & cheese topped with pepperoni, sausage, ham, bacon and hamburger. Chicken Rancher Pizza Diced chicken breast, tomatoes & ranch dressing with mozarella, provolone & cheddar cheese. Barbeque Chicken Diced chicken breast, barbeque sauce, green pepper, onion & cheddar. Gyro Pizza Specially seasoned meat and our delicious sauce with green pepper, onion and tomato. Margherita Pizza Our delicious sauce and cheese topped with tomatoes, fresh garlic, fresh basil leaves, cheddar, mozzarella, and provolone. Kitchen Sink Pizza Pepperoni, sausage, beef, hem, green peppers, onions, mushrooms, black olives & tomatoes. Lunch-two Breadsticks • Dinner-Two Breadticks & a side of fresh garden salad. Cajun Chicken Alfredo Alfredo sauce, chicken & Cajun seasoning over fettuccine. Spaghetti Meatballs Spaghetti & meatballs in a tomato sauce with oregano & garlic. Very tender & flavorful, just like grandma use to make! Spaghetti with Meat Sauce Spaghetti served with our delicious meat sauce. Shrimp Alfredo Shrimp & creamy alfredo sauce with fettuccine. Chicken Alfredo Marinated chicken in a creamy Alfredo sauce served with fettuccine. Chicken Parmesan Breaded chicken breast baked with tomato sauce & mozzarella cheese served over spaghetti. Meat Lasagna Layers of baked lasagna loaded with ground beef, tomatoes & three cheeses (cottage, parmesan & mozzarella), topped with our freshly made marinara sauce. Like a Panini – only better! Created by Fox's Pizza Den. A Wedgie is a sandwich served on a pizza crust instead of a bun. We prepare our Wedgies on a 9" crust & top it with & pizza cheese unless otherwise specified. All Wedgies are 7.99 *Topped with lettuce, tomato, mayo. Pizzaroni Fox's award winning sauce, baked with mozzarella, provolone & pepperoni. Beef, Bacon & Cheddar* Roast beef, bacon & cheddar cheese. BLT* Real bacon, baked with mozzarella & provolone. Chicken Ranchero Chicken breast strips, bacon, cheddar, mozzarella & provolone, lettuce, tomato and ranch dressing. Steak and Cheese* Choice sirloin steak, melted mozzarella & provolone, sweet peppers, onions & mushrooms. Italian Baked* Baked ham, salami, melted mozzarella & provolone, green peppers, onions, lettuce, tomato & Italian dressing. Taco Pizza sauce, taco meat, nacho chips & cheddar topped with lettuce, tomato & taco sauce. Chicken* Marinated chicken breast, baked with mozzarella & provolone. Veggie Wedgie Mushrooms, green peppers & onions, covered with melted mozzarella & provolone, topped with lettuce, tomato & Italian dressing. NEW! Gyro Wedgie Specially seasoned meat, lettuce, tomatoes topped with tomato or cucumber sauce. *Above is the standard way we prepare our Wedgies. If you want to make any changes, please just ask. We'll make your Wedgie just the way you like. Pepperoni Sticks ¾ lb. of fresh baked breadsticks topped with pizza cheese & pepperoni. Chicken Fingers Served with BBQ, Honey Mustard or Ranch. 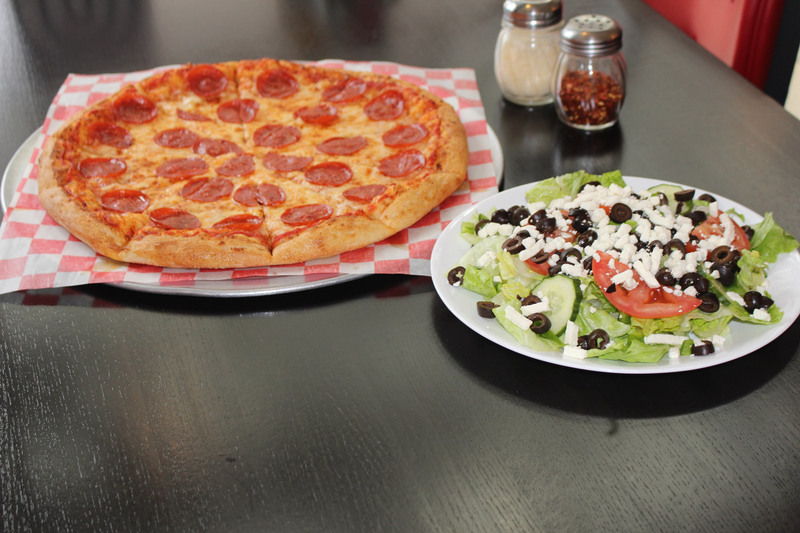 You may order any of our Pizza Toppings in your Stromboli or Calzone. Calzone includes ricotta cheese and served with sauce on the side. Stromboli has sauce inside. Custom Sauce, cheese & up to five pizza Toppings of your choice. Meat Supreme Pepperoni, sausage, ham, bacon & beef. Pepperoni Double pepperoni & extra cheese.